Approximately 7 months ago, our patient came to Dr. Cole’s office for sonicated PRP. Sonication performed for the proper duration of time and sequence can result in a 5 to 8 times greater concentration of growth factors using our Angel system. Notice how our patient’s hair is darker in color in the photo on the right. As hair miniaturizes it’s common to see shorter, finer caliber hairs that are lighter in color. The following photo reflects the effectiveness of sonicated PRP and was taken just before our patient’s FUE procedure last week. The same day the photo above on the right was taken, our patient received 2,626 FUE grafts. Next year about this time we expect significant growth. The following photo is immediately post-op, 4-10-17. This is impressive. You can notice the thicker hairs. Dr. Cole, how long does this last? Does the Treatment need to be repeated to keep the effect? Would this also help reduce recipient zone scarring? Could it help with donor or recipient shockloss that may have not returned?? Sorry for the delay. I had a busy week with many projects and so much work. We are uncertain how long PRP will last. First, there are many different kits for preparing PRP. Some kits produce much higher concentrations of growth factors than other kits. Some kits allow for a higher concentration of platelets. The total concentration of growth factors will be dependent to a degree on the number platelets available. We found a difference in the concentration of various growth factors depending on the kit we used to make PRP. We eliminated the PRP kits with lower concentrations of growth factors. Second, when platelets aggregate, they form a mesh or plug. The pores in the plug allow growth factors to diffuse out. In our study, we found equal concentrations of IGF-1, which is a smaller protein (7.6 kDa) than other growth factors such as TGF-b, VEGF, and PDGF-BB, which range between 25 kDa and 38 kDa. Presumably, the smaller size growth factors can diffuse out quickly while the larger ones are trapped inside the plug. When we took the best commercial kit we studied and subjected this PRP to sonication or sound energy for 30 minutes of total sonication, we were able to achieve 6 to 8 times the concentration of growth factors We centrifuge this platelet lysate and discard the cellular debris. Thus, we inject very high concentrations of pure growth factors with this method. We now know that our sonicated PRP increases the yeild of grafts over time. We see up to 99% of the grafts growing at 4.5 months and over 80% at 3.5 months. We also see a much stronger response in native hair to sonicated PRP. With sonicated platelet lysate or cytokine-rich plasma we often see an increase in the haircheck number at 6 months. We never saw this with standard activated PRP. We also know that PRP with Acell increases hair counts much better than when PRP is injected without Acell. Now the next questions. How frequently do you need injections to maintain the benefit. We are still studying this. I presume every 6 to 8 months. The next question is how long will you respond to these injections. We don’t know. We are trying to study this. However patient follow-up can be an issue. We need people to come back to evaluate the results and create enough data. There is a doctor named Ahmed, who presented a paper in Bangkok in April. She showed that strip scar width was less when he injected the strip wound with PRP. Can PRP with Acell increase the yield of grafts in scars? Yes. 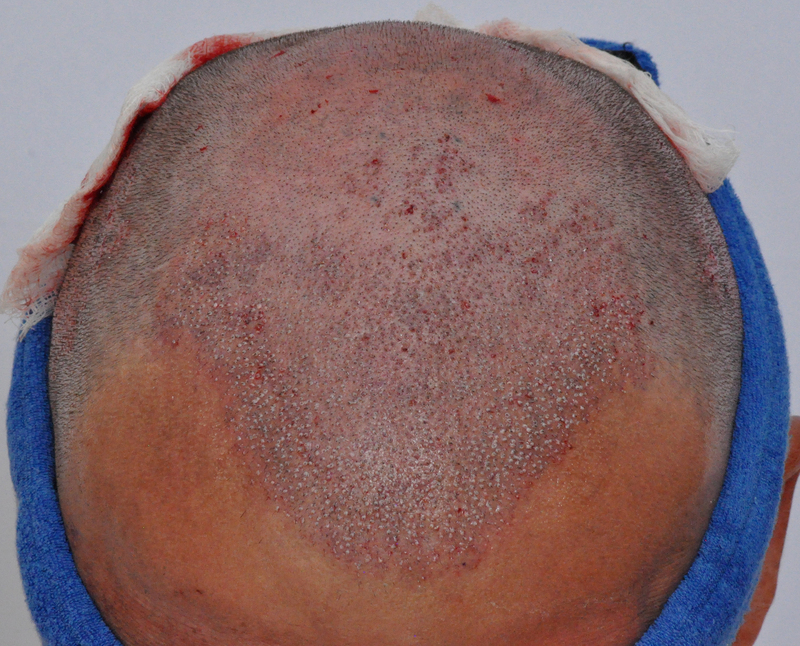 in a study I performed, I treated the right side of the scar with beard hair, PRP and Acell. 100% of the grafts grew. At the same time, I treated the left side of the scar with chest hair grafts and no PRP nor Acell. 0% of the chest hair grafts grew. In a follow-up, I treated the left side again with Chest hair and this time added PRP and Acell. 100% of the chest hair grew. Will PRP and Acell always increase graft yield in scars? I don’t know. I recently had a poor result in a scar. I think it was my first poor result in a scar with beard or scalp hair. However, there is some soil in which nothing will grow. Yes, the adipose around the scar would be a useful thing to use to make adipocyte-enriched stem cell nanofat for injection into the scalp. I think scalp adipose from the perifollicular region might be beneficial to hair growth. We know that adipocytes from the deeper abdominal fat do nothing. In Ankara at FUE Europe May 18-21, we will demonstrate and study the removal of perifollicular adipose from the lower abdomen and pubic area to see if we can stimulate hair growth. Another exciting breakthrough in cell-based therapy is the injection of follicle stem cells into thinning areas. Follicle stem cell injection works well if you have hair. It will not work if you are bald. We plan to keep picking away looking for better solutions including the addition of microparticles. Incidentally, Acell probably helps to activate platelets and this is why Acell results in higher hair counts when combined with PRP. What Percentage of patients that receive sonicated prp/acell are seeing early growth of grafts at 3 and 4 months? It appears to be cutting the shedding and regrowth phase quite substantially. Isn’t it like 8-12 month normally. So far, 100% are getting earlier regrowth. It’s fascinating, to be honest, and the most exciting new cutting edge development. At FUE Europe last Saturday we performed several new procedures including the harvest of perifollicular adipose cells from the abdomen, scalp, and beard, which we activated with PRP and Acell in a side by side study with follicle stem cells plus PRP and Acell. We are following two patients as a result of this groundbreaking protocol. Results will follow. This is all cutting edge new cell therapy. Dr Cole, reading that 100% are getting earlier growth is very promising. This is pretty exciting. Hope to see some more before and afters soon. The patients in your study, were they initially virgin scalp or had multiple procedures prior to getting the recent procedures done? It would be interesting to see how this would also yield/benefit patients that are undergoing repairs or shockloss related density issues. Very interested to see if scalp hair, beard hair, body hair reacts similarly with the addition of this treatment in recipient zones. Thank you for the update. @Dr_Cole I remember you have been testing PRP for many years now, thanks for not giving up on this, it sounds like you are making some progress with this finally. We have another result to post from about 4.5 months out. Our patient has remarkable growth at this stage, but this patient was not in our study. In this instance, the patient had a prior procedure with another physician in Florida, but the growth was quite weak. Thus, you could consider this as a platelet lysate or CRP rescue. For the study, I wanted virgin scalps with bald crowns. I will enroll another patient hopefully next week. We have not investigated repair cases yet. We know from our patient assesments that healing is much faster with PRP. We have not studied shock loss, but we don’t get many complaints about shock loss with our platelet lysate. Still, the percentage, who get shock loss, does not matter if you are the only one out of 100 patients to get shock loss. No one wants shock loss, but this would be worth studying too. We are in the process of developing a much larger research center in Mexico City, Mexico where we will offer high quality at very affordable pricing, but we will also be able to enroll more patients in research. We will also be able to study stem cells in greater depth. I am very excited about the process in Mexico City.